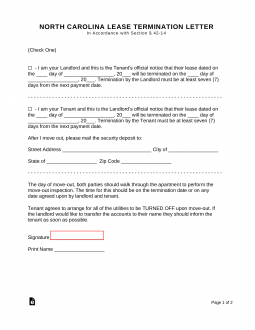 The North Carolina Lease Termination Letter Form | 7-Day Notice allows either the landlord or tenant to provide one to the other, the intention to vacate the premises in 7 days. On the day that the tenant will move out of the premises, the landlord and tenant should walk through the premises. As well the tenant must be responsible to move all utilities and services. As well, if the landlord would like the utilities into their name, it’s the landlord’s responsibility to let the know that this is their preference. If the landlord fails to advise the moving tenant that they would like the tenant to move the utilities to the name of the landlord and any damages occur, the tenant cannot be held responsible for any such damages. In the event either party does not understand the language of this notice, you may wish to consult with an attorney prior to service.